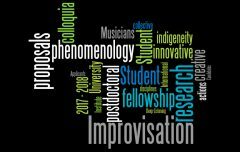 Postdoctoral fellowships for this Institute support the most promising new scholars in the emerging interdisciplinary field of critical studies in improvisation and assist them in establishing a research base at an important time in their research careers. The Institute is particularly interested in critically informed interdisciplinary research proposals that are prompted by the theory and practice of contemporary improvised music and its related social implications. The research program seeks to create a climate of genuine intellectual excitement where scholars pursue research projects and participate in collaborative research activities as part of a broader network of critical practice. Postdoctoral fellows are expected to participate in project seminars, institutes, and annual colloquia, and will benefit from the stimulating intellectual environment provided by both an extensive and inter-institutional research network and a wide range of community partners. The deadline has now passed for the 2019-2020 academic year, and no new applications are currently being accepted. Please check back to this page regularly or watch for updates in our News section. IICSI is a partnered research institute housed at the University of Guelph in the College of Arts. Our scholars work on improvisation at the intersection of arts, community, and social change. The Institute is comprised of 56 scholars from 20 different institutions. IICSI’s partners include six academic institutions (University of Guelph, McGill University, Memorial University of Newfoundland, University of Regina, University of British Columbia, and the University of California, Santa Barbara), a foundation partner (Musagetes), and over 30 community-based organizations. Our team engages, connects, and mobilizes scholars, students, creative practitioners, and community partners in order to create a vibrant intellectual hub, and a focal point for research and critical inquiry in the field of improvisation studies. We encourage participation in the development of innovative and sophisticated approaches to gathering, analyzing, and disseminating knowledge by actively involving students in every phase of project planning and implementation. For more information about IICSI, visit our website at improvisationinstitute.ca. The deadline has passed for the most recent Call for Applications and no new applications are currently being accepted. Please check back to this page regularly or watch for updates in our News section.